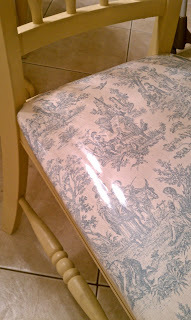 I’m so excited to be posting a furniture project! ….and this was a very special project for me. 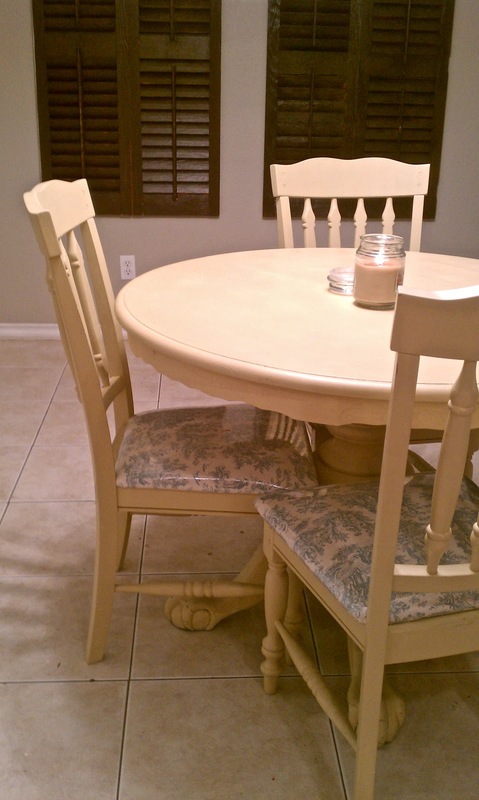 My sweet sister has been desperately needing a dining room table for uh…. 2 years-ish! She has had a vision in her head of what she wanted and never had the cash to get exactly what she wanted! (Who does anywho?! Not me!) 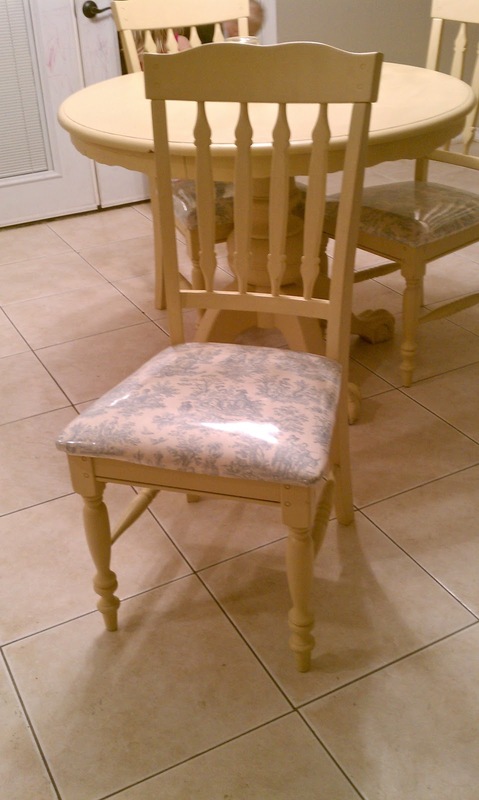 So we did what we do best….Upcycled! My mother-in-law had this great coffee table, that had seen better days. My grandma had this claw foot table and only the base survived her home burning down in April of 2008. There were only a few things that survived the fire and this was one of them! It goes without saying that this is a VERY special piece we wanted to save! 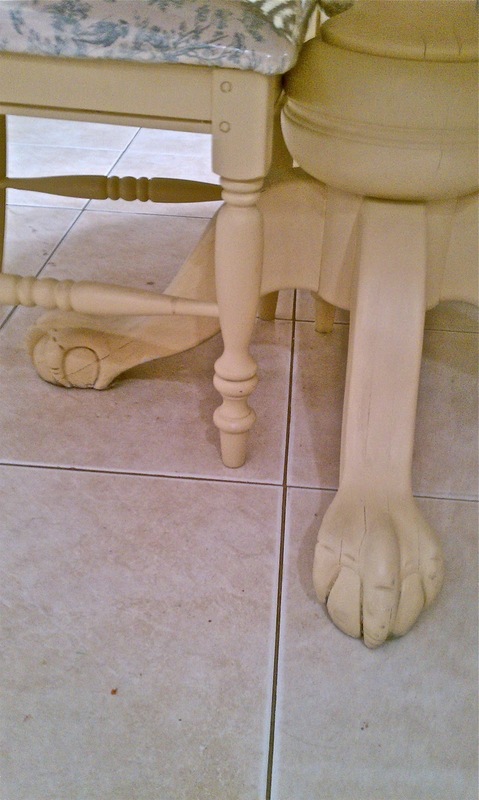 Look at those claw feet! Have Mercy!!! LOVE! Can you see where I’m going with this!? We had the BRILLIANT idea of merging the two to create a great dining room table for my sister! 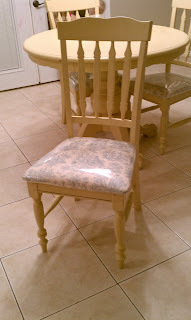 My mother in law also had 4 GREAT chairs she wasn’t using anymore because she was redoing her own dining room! That’s another post in itself! Stay tuned for that one! Anywho… My sis wasn’t home at the time so we were able to get it done to surprise her! My favorite thing to do! I LOVE MAKING THINGS TO SURPRISE PEOPLE! Seriously. First, we removed the top of the coffee table! 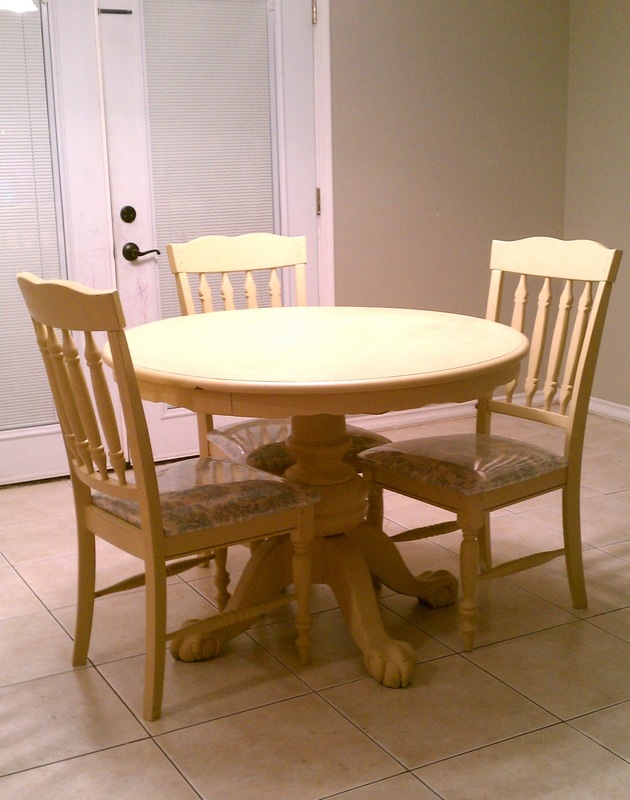 This baby even has a leaf that she can use to enlarge her table when her family grows too big for this 4 chair dining set! We got some paint and got down to business! Here’s what we came up with! My sis loves this blue color and toile! We found this fabric at Joann’s. MY favorite part! 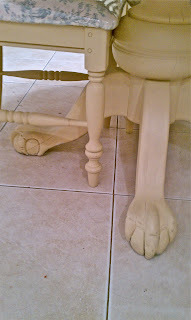 Look at the detail on the table base and the chairs! Aren’t her shutters on the wall so cute??! I got those for FREE from Jenny over at Envy My Cooking and gave them to my sis. She painted them and hung them up! Love it! Well did she love it? I love the detail and the color! I absolutely love the shape of it! 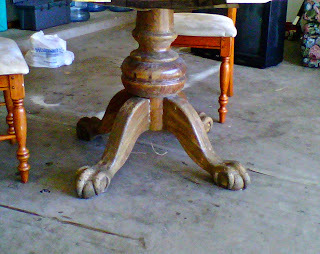 I eventually need to do something with our clawfoot pedestal dining table, hmmmm. feel like visiting? Very clever and so sweet of you to surprise your sister. Great job. This was such a clever idea! 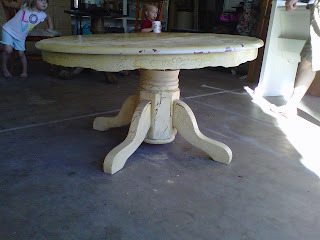 My step-mom and I have been trying to find an old round table for her dining room. 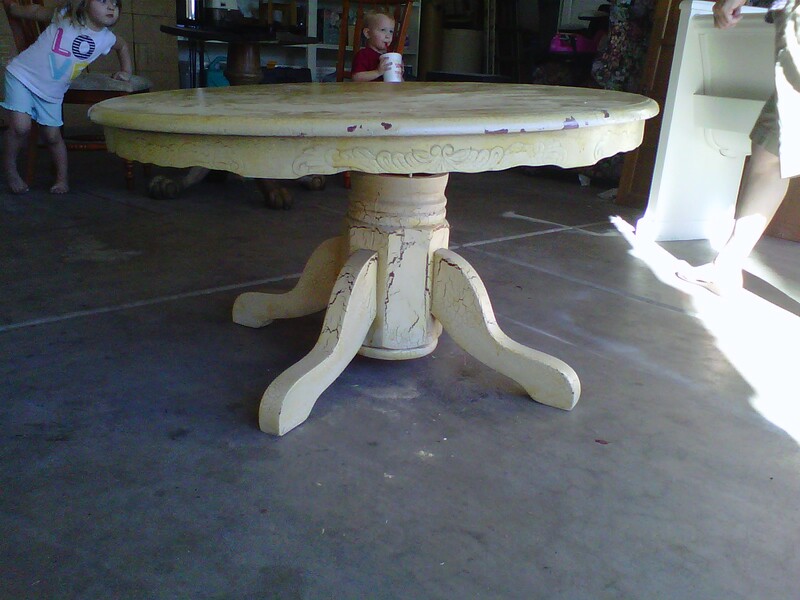 And today we found a bid round coffee table! Hoping it is still there tomorrow!! Thnks for the idea!! I’m a new follower now!! Hope that you are able to check out my very new blog and follow back!! Oh yeah, can you glaze over matte paint? I tried to and when I wiped the glaze the paint started to come off!! Any ideas why!? WOW! Great job and very creative idea.